My good friend Captain Hank of Salt Water Addiction Guide Service in Matagorda, TX, first introduced me to the coho in 1994. The Coho is an excellent bait for speckled trout and redfish. Captain Hank taught me how to wade the grass beds in the bays and how to jerk the Coho along so that no speck or red within sight of the lure could resist it. The largest red I’ve ever caught was 36 inches….and I caught him on a 0.5 ounce Coho head with a Queen Coho body. Mark Macnamara, a fine gentleman and an EXCELLENT striper guide on Lake Texoma also convinced me of the coho's value. Mark mentioned the “Coho”! 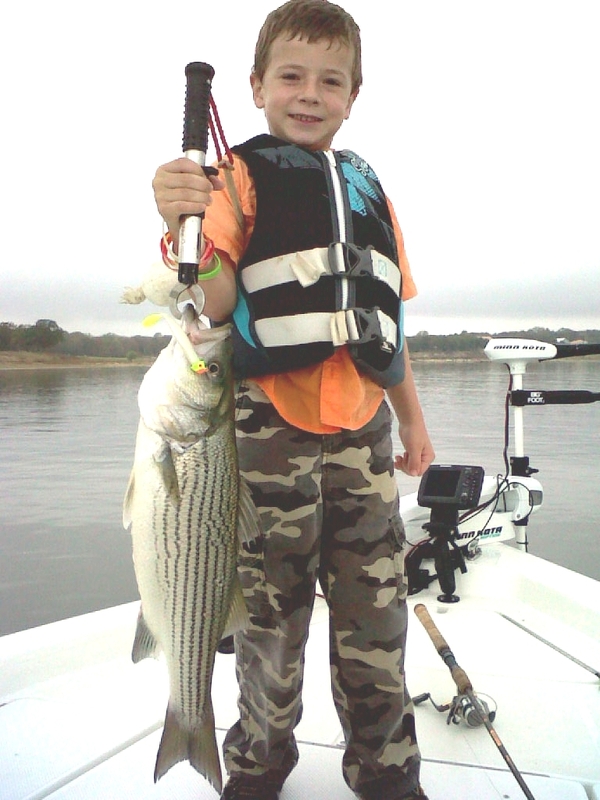 I thought “could this be the same killer bait on striped bass as it is on specks and reds?” Well, Mark proved the answer to my question to be “YES”! 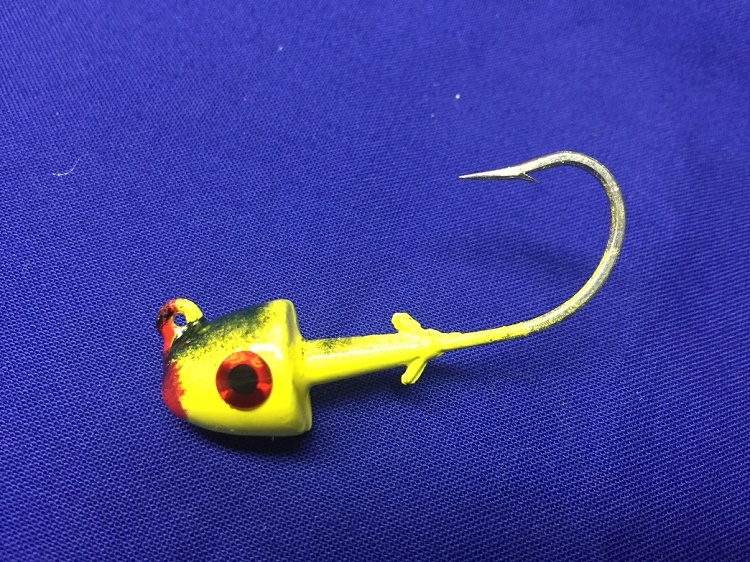 This lure is fished similarly to the sassy shad: fast retrieve, slow retrieve, retrieve and drop, slow rolled, and dead. Whenever you know there are fish around you and they will not strike a sassy; tie on a Coho. The stripers often prefer the slim body lines of the Coho to the fatter profile of the sassy shad. THE PHOTO BELOW SHOWS A 3D EYE. I'M NOW PAINTING ON A BLACK EYE. THE CURVATURE OF THE COHO MAKES IT ALMOST IMPOSSIBLE FOR THE EYE TO STAY ATTACHED VERY LONG. I'LL UPDATE THE PICTURE AS SOON AS I CAN. BUY NOW!! YOUR TACKLE BOX IS NOT COMPLETE WITHOUT SOME OF THESE!! I offer several options. Plain Glow. Glow with tails dyed in Chartreuse. 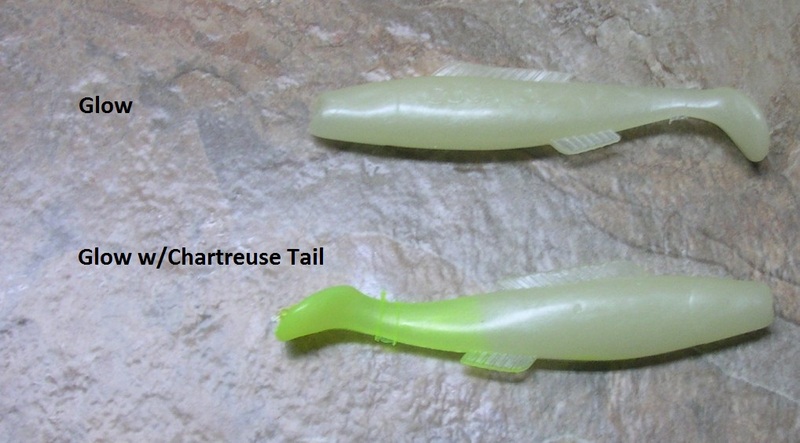 Glow with tails dyed and treated with shad oil fish attractant! !